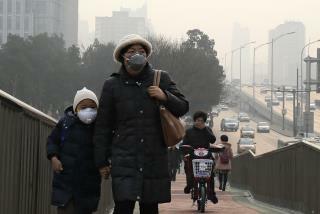 In 2016, 600,000 children were estimated to have died from acute lower respiratory infections caused by polluted air, reports CNN. About 1.8 billion children worldwide—that would be 93%—breathe air so toxic that it puts their health, their physical development, and their intelligence at risk, reports the Guardian. In poorer nations, a staggering 98% of children under the age of 5 are exposed to PM2.5, one of the most harmful pollutants, in levels that exceed the WHO's safety guidelines. The pollution isn't always of the outdoor variety: The burning of wood or paraffin for heating, cooking, and light also takes a toll, especially in poorer nations. Pregnant women who breathe such dirty air are more prone to deliver premature and underweight children. Air pollution is the "new tobacco" and is responsible for 7 million premature deaths annually, writes WHO Director-General Tedros Adhanom Ghebreyesus in a Guardian op-ed. The report is out on the eve of the group's Global Conference on Air Pollution and Health. Yup...gotta stop smoking that pot as well. Bad for everyone. This is such a joke, kids these days never go outside, the video games are by the couch. And I'll bet the answer is more government and government solutions which will require a completely new government bureaucracy that will employ 100,000+ new government workers that we obviously have to pay a "living wage" of say $80,000/year plus benefits to start. Those bureaucrats will then spend their days dreaming up new legislation, rules and laws that will have to be imposed on the populace to ensure those 600,000 kids do NOT die each year. What do those that always promote more government always spout? "IF WE CAN SAVE EVEN A SINGLE CHILD IT WILL BE WORTH IT." Everyone that believes this twaddle being disseminated by WHO, raise your hand. Hmmm..., just as I thought.